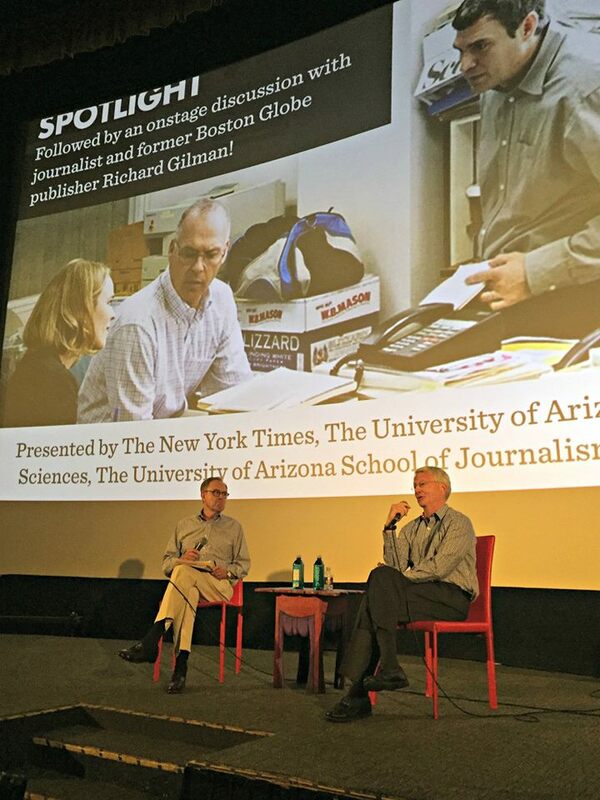 Former Boston Globe publisher Richard Gilman spoke after the Sept. 25, 2016, UA Journalism on Screen showing of the Oscar-winning "Spotlight," which depicts the Globe's investigative series on sexual abuse by Catholic priests. 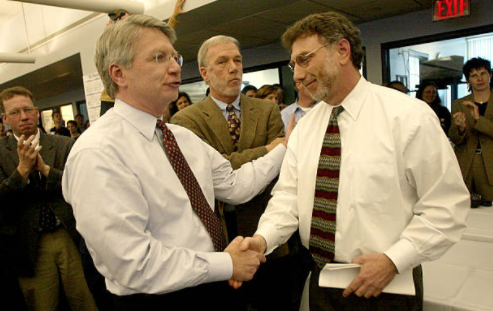 Richard Gilman congratulates then-editor Marty Baron after The Boston Globe won the 2003 Pulitzer Prize for Public Service. Richard Gilman’s career in journalism is an inspiration for students who aspire to make their mark in the field. He earned a B.A. degree in government and journalism from the UA in 1972 and an MBA from Harvard Business School in 1983. Gilman served in a number of positions at The New York Times Co. before being named publisher of The Boston Globe in 1999. The Globe won three Pulitzer Prizes under his leadership, including the Gold Medal for Public Service for the paper’s investigation into sexual abuse by Roman Catholic priests in the Boston Archdiocese. But Gilman began his career as a journalist with the Arizona Daily Star in Tucson in 1970, going to college during the day and covering the police beat at night between 4 p.m. and 1 a.m.
That early hard work showed a dedication and professionalism that followed him throughout his career. Michael Chihak, former publisher and editor of the Tucson Citizen (and now news director at Arizona Public Media), was a year ahead of Gilman when they were journalism students at the UA. They were both reporters for the Arizona Daily Wildcat, as well as competing rookie reporters for Tucson papers: Gilman at the Arizona Daily Star and Chihak at the Citizen. Gilman recognizes that the college years are an important time to offer life-changing opportunities to students. “This is the time in life when young people are exploring the opportunities that are open to them,” says Gilman. “These ought to be the highest-quality opportunities we, as a society, can provide for them." When Gilman retired in 2006 as publisher of The Boston Globe, his bosses wanted to recognize his illustrious journalistic career. So The New York Times Co., the Globe’s parent company, endowed a $25,000 scholarship in his name in the UA School of Journalism. Gilman remembered how tough it can be for students to juggle classwork, jobs and internships. So to ease that burden, he and his wife, Wendy, added another $40,000 to the scholarship endowment in 2008 and gave more after that. The Richard Gilman Scholarship was awarded for the first time in the spring of 2009. “Our purpose with this scholarship is to encourage the best and brightest to learn about the field of journalism and to practice the profession. We believe strongly in the importance of journalism and the quality of the UA School of Journalism,” says Richard Gilman. “I want to give back some of the opportunities that were given to me." Gilman believes the skills taught by the UA School of Journalism are crucial to preparing thoughtful, well-prepared journalists. He emphasizes the importance of students learning, not only the tools of the profession — how to gather and present information effectively — but also the ethical standards of the profession. And although many newspapers across the country are struggling to find readers and advertisers, Gilman thinks this is a promising time to be a journalist because of the growth in news outlets. “I see journalists as intermediaries — extremely critical intermediaries — between those public officials and institutions that have information and the general public who needs that information to be part of a well-functioning society,” says Gilman. “There are a variety of media that can be that in-between, whether it be newspapers, the Internet or visual media. There are probably more opportunities for young people these days."